LAS VEGAS -- To say that Brooklyn, N.Y.-based startup BioLite is “cooking with gas” would be equal parts accurate and inaccurate. Yes, the company is here in Sin City, exhibiting its wares at the Eureka Park startup zone at CES. And, yes, the company says it is on track to gross more than $10 million this year. So it is definitely on an upward trajectory. But BioLite’s success isn’t running on gas. It’s fueled by wood. Let me explain. Co-founders Alex Drummond, 54, and Jonathan Cedar, 34, started BioLite in 2009 as frustrated campers who were tired of carrying bulky gas canisters on their trips into the wild. With Cedar’s background in engineering, the men spent the next three years tinkering on weekends, cooking up a solution to their problem. What they eventually came up with was the BioLite CampStove, a neat contraption that stands just 8.25 inches tall and weighs a mere 33 ounces. Simply add wood (for campers, a resource that’s usually easy to come by), start a fire and then start cooking. 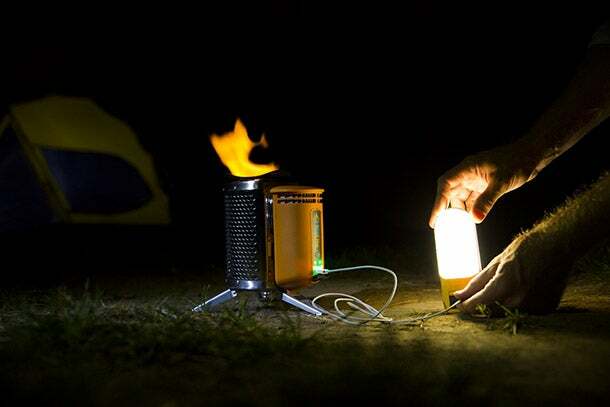 Inside the CampStove, a thermoelectric generator converts heat from the fire into electricity that’s used to power a smoke-reducing fan and get this: to power up your mobile devices via USB charger. Hot food, a heat source and charged-up smartphones, all in an easy-to-carry device? Score, score, score and score again. Drummond and Cedar later realized their invention could also have a social impact beyond the camping crowd. With more than 4 million deaths a year around the world attributed to cooking over smoky, open fires, the men tweaked their concept and came up with the BioLite HomeStove. The idea is to help families who live in “energy poverty,” relying on smoky open fires as their main cooking source while also spending a disproportionate amount of their income to access lighting or electricity. BioLite now has a line-up of six products ranging from $99 to about $300. Here at CES, the company is unveiling the BioLite NanoGrid, its entry into lighting and power-storing gadgets. Entrepreneur: What brings you to CES and Eureka Park this year? Cedar: We have worked to make clean cooking and device charging a reality using nothing but sticks for fuel. We’re now expanding our technology platforms to include lighting and power storage, two needs that are just as fundamental to safe, productive living as cooking. Entrepreneur: It’s neat that you developed a high-tech solution that’s powered by a low-tech fuel supply. Cedar: Energy is all around us, we just need the right tools to harness it. While our needs for energy get more complex with the devices that fill our lives, the original sources remain the same. We’re excited to develop technologies that enable us to unlock energy access on a personal scale. Entrepreneur: The CampStove is relatively small, but how easy is it for campers to carry around? Cedar: The CampStove is incredibly mobile and nests within itself when not in use to take up minimal space in your pack. The BaseCamp model is built for larger group cooking, so it’s designed more for car camping, tailgating, etc. However, its design includes folding legs and a carrying handle for easy portability to your location. The HomeStove, similar to the BaseCamp, is designed for heavier loads of cooking and therefore requires materials like cast iron. However, it has also been designed to be moved easily. Entrepreneur: Tell me a little more about BioLite’s social mission. Cedar: We pursue a model we call “Parallel Innovation,” where we incubate core technologies with the potential to empower millions of families living in energy poverty around the world. Then we commercialize the resulting products in both developed and developing markets. The near-term revenue generated from our developed markets gives us the cash to invest in growing our developing markets business to a point of economic sustainability. This is different than a one-for-one model in that once our developing markets achieve critical mass, they can economically sustain themselves through customer driven demand rather than relying on an influx of donations. Entrepreneur: Where do you see BioLite this time next year? Cedar: I hope by this time next year, our customers will see us at their trusted source to cook, charge and light their way, whether in a rural village in India or a backpacking trip in Yosemite. Don't Have a 3-D Printer Yet? This Startup Wants to Change That.